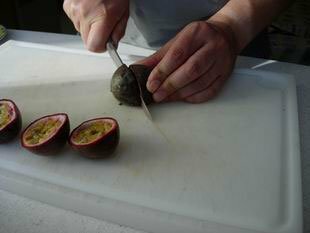 Passion fruit are rather strange fruit as they do not really have much flesh, but rather seeds surrounded by a fine layer of pulp. 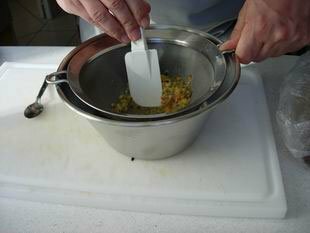 Here is a way to extract the juice. Cut all your passion fruits in half. Put the strainer over the bowl. Remove all the seeds from fruit with a tablespoon, and put them in the strainer. With the maryse, press the seeds with a to and fro movement. This will push the juice through the bottom of the strainer, and eventually into the bowl. Stop when only the seeds are left in the strainer, then discard them. 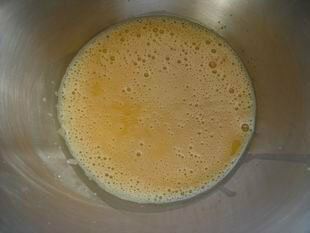 You can use this highly perfumed and tasty juice in your recipes, like fruit jellies for example. 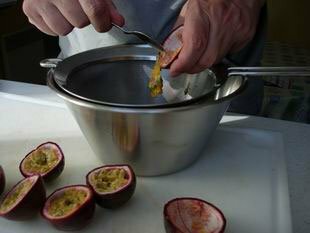 Passion fruit are (in metropolitan France) rather expensive, but they have a gorgeous taste. Thank you for the great advice! Would using this juice work in making a passion fruit icing, or would it be better to use a flavor extract? I'm not sure if this would make the icing runny. It's better to use the juice, more fresh and tasty. I made a semi promise to try a different fruit or vegetable each month that I've never tried. (You only live once). This month was passion fruit. Yes, they are expensive. In the Sacramento area, CA I spent $8.97 USD for 3 at Safeway. With that said, they are very good, sweet & juicy. I put mind in a blender, added a little water & blended for several seconds (don't puree). Put through a small sieve. Thank you for this post. I stumbled upon it & that gave me the the inspiration to try them. I'm thinking an after dinner drink with vodka.